You know that phrase about “talking turkey?” Well, with Wes Morton of AGAINN, I got to “talk bacon.” Like bacon, our discussion was fulfilling, meaty and even a tad salty. In October 2009, Morton and the team of colleagues who recruited him to return to Washington, opened AGAINN, pronounced ‘a-guin,’ a self-described “British Isles bistro.” Though AGAINN is new to its swanky digs at 1099 New York Avenue, NW, Morton is no novice. He comes from a “high-end background,” having worked in kitchens at D.C.’s Citronelle and CityZen, and Left Coast establishments such as the French Laundry and The Ritz-Carlton, Half Moon Bay. Morton is using his high-end skills to bring Washingtonians down-to-earth, quality meals in a comfortable environment. I can’t vouch for the food – haven’t eaten there – but here’s some insight into the philosophy behind it. When asked about the most misunderstood or under-utilized ingredient in the kitchen, he had to think about it for a minute. “Vinegar,” Morton said. “It can be used in different ways to balance a dish. You can use vinegar and lemon juice to turn a good dish into a great dish. We use vinegar to pickle beet stems used in salads and as garnish. We pickle mustard seeds for a charcuterie plate. It pops like caviar.” Added to drinks at the bar, you can also find pickled carrots and green beans from Morton’s kitchen. As far as seasoning goes, he keeps it simple. Morton salts proteins a day ahead – like his braised chicken, for example – so that it penetrates the meat. It draws out the moisture and then he adds flavor with liquids such as bourbon. “I season steak the same way, with herbs and salt and pepper in a bag.” Then he adds olive oil once the meat is primed and ready to soak in the flavor. 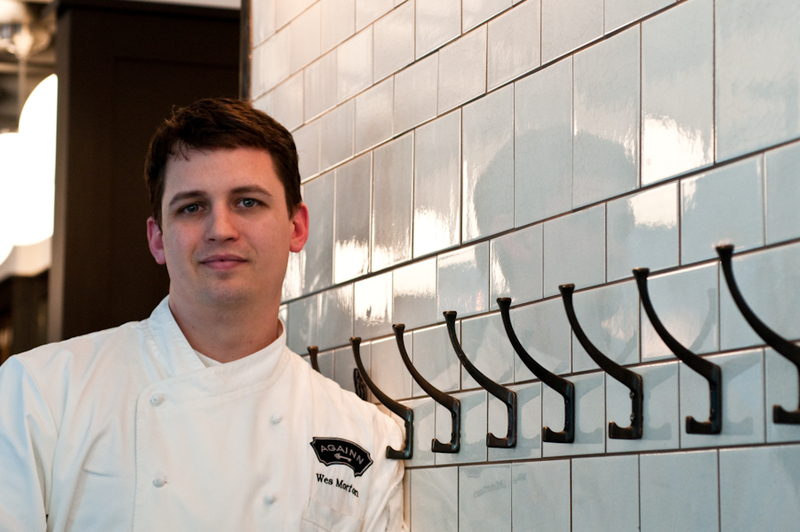 Tune in tomorrow for the exciting conclusion to our interview with Chef Wes Morton of AGAINN! To view more photos from the interview, visit http://staceyviera.zenfolio.com/againnchefinterview. And enter our CONTEST to win a food print! In the comments section, tell us what you would ask a chef about nutrition. We’ll randomly select a winner by 5 p.m. Wednesday and announce it on Thursday’s blog. You must have a U.S. address (sorry, but I won’t mail the print internationally) and be our Facebook fan to win! I would like to ask a chef about how to eat healthier when dining in his/her restaurants. IE – What are the dished on your menu that you recommend? I would ask the best way to find out proper nutritional portion size from the dishes I love when eating out at a restaurant. (and maybe also how to encourage restaurants to focus less on super sizing everything and doing more in moderation). If I love the dish and they give me 3 big portion sizes but serve it on a large plate that makes it look like 1 or less servings then I’m likely to eat the entire thing without even thinking about it. I’d ask if it’s disrespectful to order food simply prepared without sauces or having the food cooked in oil or butter. When calorie counting is a priorty and eating in a restaurant is unavoidable, sometimes I’m forced to greatly modify a dish from the menu. I would hate if someone saw one of my paintings and asked me to make it again without using so much green paint (or something equally obscure) so I have always wondered if the chef’s artistic integrity is at stake. I would love to find out more from a chef about portion sizes and if they take into account how they actually compare to what guideline portions are. I’d like to know how a chef follows healthy eating when they’re in the industry. Are they tempted to eat everything or do they have the will power to eat healthy portions?